Do you have heart failure? Ready to try me at home? We’re looking for people who have heart failure to try me, Mabu, in their home for at least a month and provide feedback on their experience. 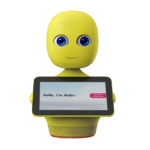 I’m an easy-to-use robot that will have conversations with you about your health and wellness. No technical experience necessary! By participating in this trial, you’ll learn more about how to manage heart failure and stay healthy. You’ll also help make me a better bot for other people managing their heart failure. Plus, as a token of our appreciation, you’ll receive a $100 gift card after you’ve completed 2-3 interviews during your first month with me. Ready to participate? Click the sign up button. I can’t wait to meet you! If you’re a medical professional and want to learn how I can help your patients, email us at info@cataliahealth.com.